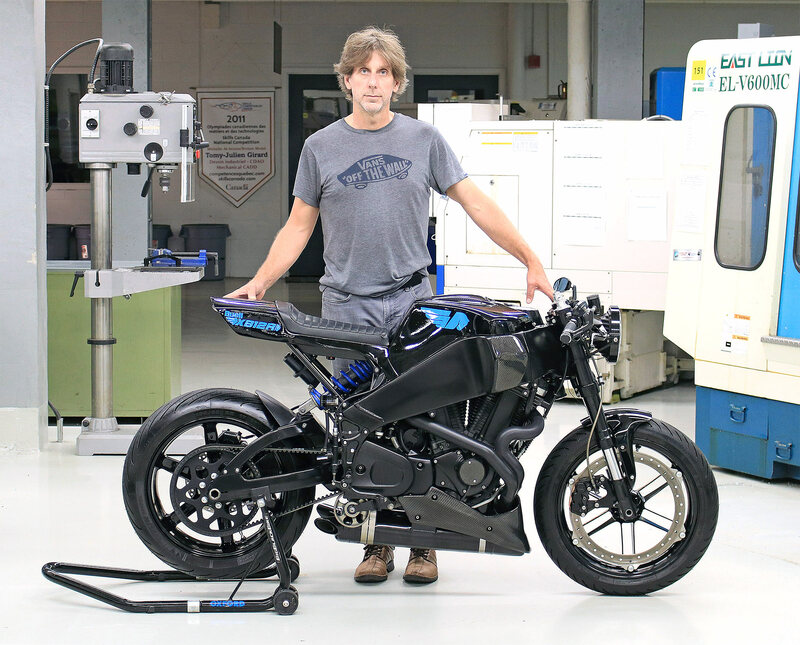 The story of Erik Buell, motorcycle engineer and designer, has been a roller-coaster ride of enormous highs and lows. 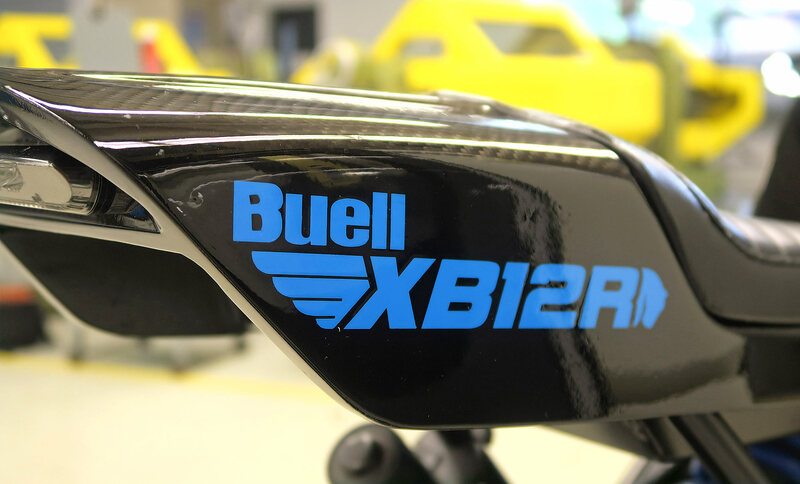 Buell is a bonafide genius, his desire to build the true American Sportsbike has led to some incredible innovations. But financial woes, Harley Davidson’s timidity and having to compete with the biggest players on the planet has made it a struggle. But imagine if he’d been joined decades ago by Prof. Sylvain Carignan, who designs high-tech Catamarans from cutting-edge composite materials. 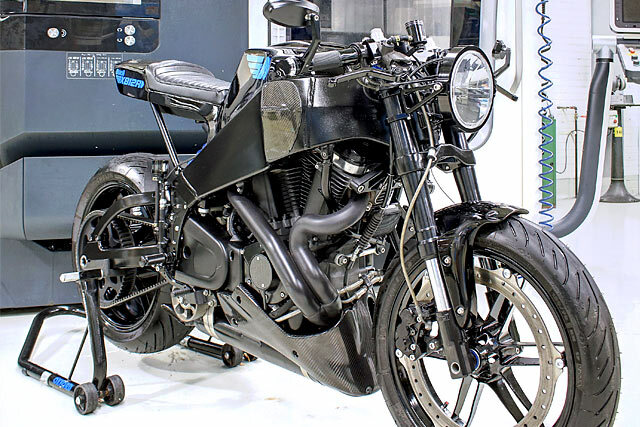 Wonder no longer as the Professor serves up his custom carbon cafe creation, a 2004 Buell XB12R called Simone. Given the gearbox was toast and the engine would have to be removed it made sense to give the V-Twin a complete overhaul and Sylvain doesn’t do anything by half measures. The HD derived 1203cc lump has had the bottom end treated to new bearings, seals and gaskets. While up top the 2 valve heads have been refurbished with a catalogue of new parts thrown their way. 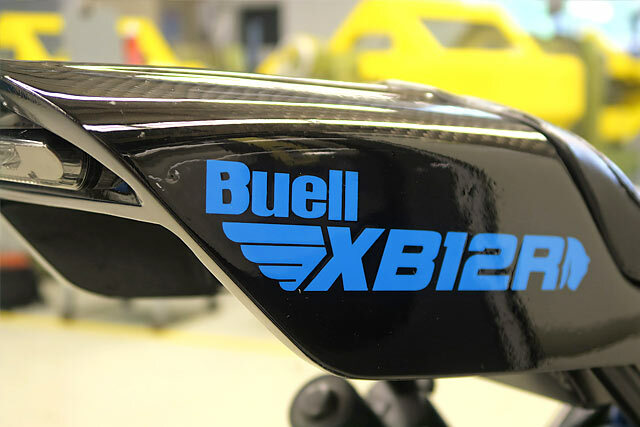 As intended the exhaust system remains with the headers ceramic coated and the lower muffler not only retaining the look but the Buell InterActive components that are ECM controlled to modulate gas flow for smooth torque and more top end. “Once the mechanics were complete, I invested a lot of time in the search for the perfect line. In my opinion the best line is a line taut but not straight, like a typical cafe racer. I rather do it slightly angled like a street fighter but without going too far,” informs Sylvain. But coming from the world of big dollar boats his designs aren’t done on scrap paper, instead, an enormous amount of time was spent in SolidWorks perfecting the design of the two key components he wished to change. 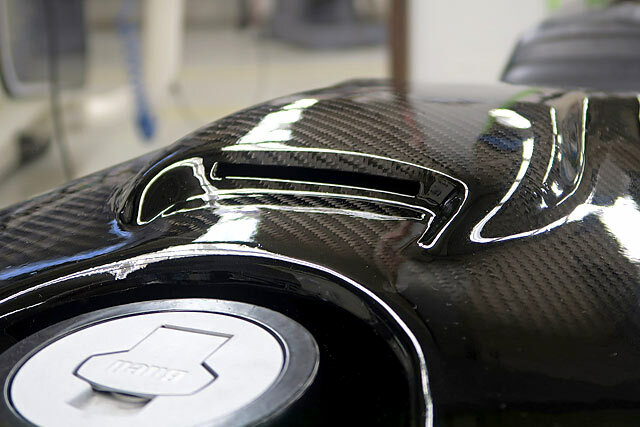 The airbox cover that would serve as the fuel tank on a conventional bike and the rear cowl to match. 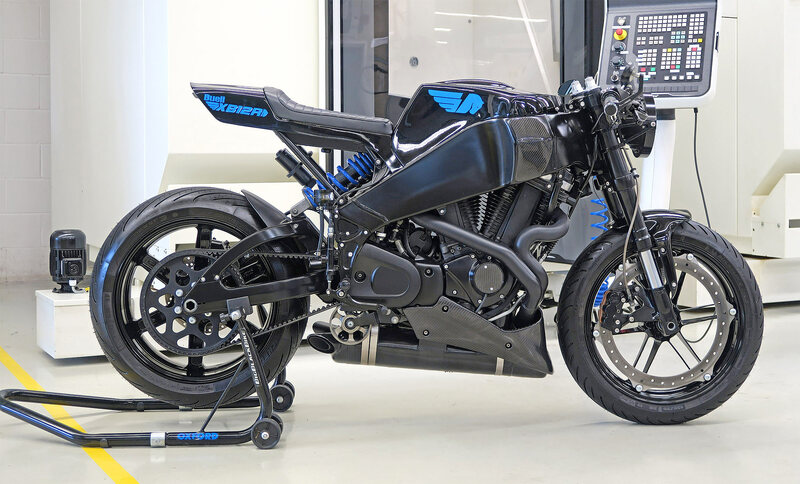 From the design in SolidWorks Sylvain uses another high-end piece of equipment, a 3D printer to create the moulds in which the parts will be formed. 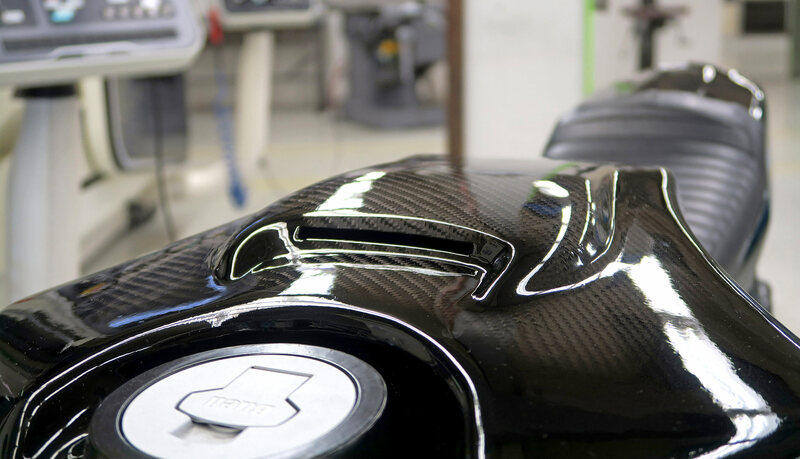 They’re then transformed into the final product from 100% carbon fibre using an infusion technique that results in complete uniformity across the piece, infinite repeatability and unrivalled strength. 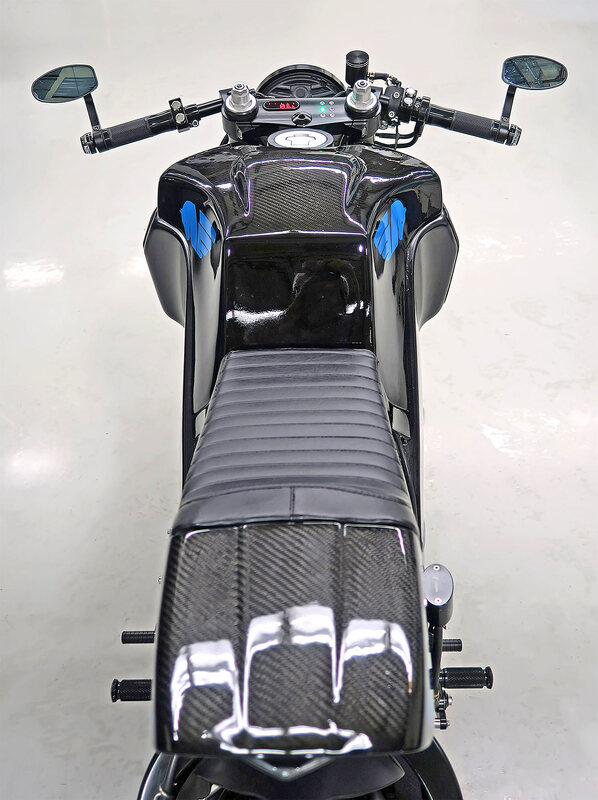 The stunning airbox cover gives the XB very different lines from the now dated round hump. While also including various vents and recesses for the ultimate in form and function. “ I invested many hours to find the perfect shape. I would say almost one month,” clearly Sylvain is a perfectionist. 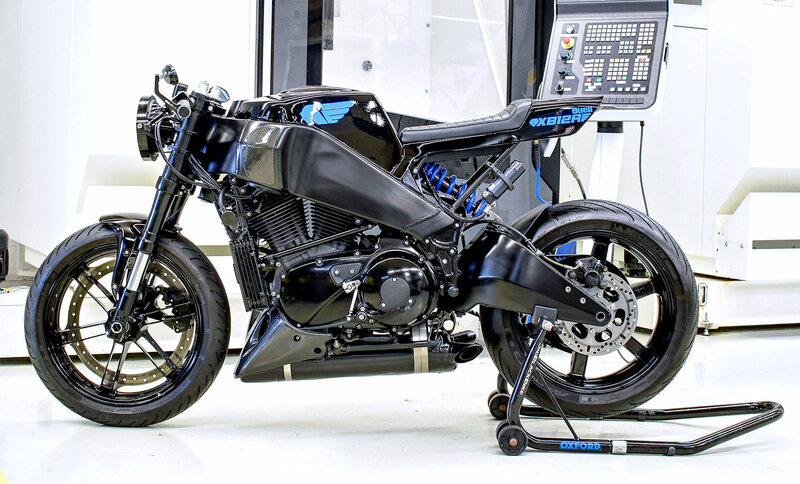 The next piece to conquer was the rear cowl but with the design the Professor had in mind, and wanting to save weight and create a more minimalist look the stock subframe had to go. The boxy factory item is replaced by a shorter round bar fabricated item that exposes more negative space beneath the seat. Once again Sylvain’s design was brought to life by the industrial machines available at the Catamaran shop and not only has he created the ultimate tail to match the tank, the two merge together seamlessly. 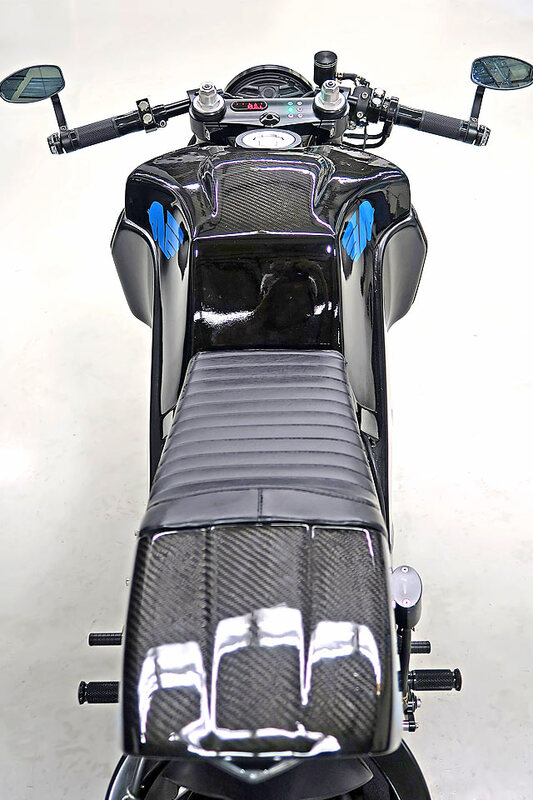 A nicely padded seat was hand stitched to match from black leather for the perfect place to sit. 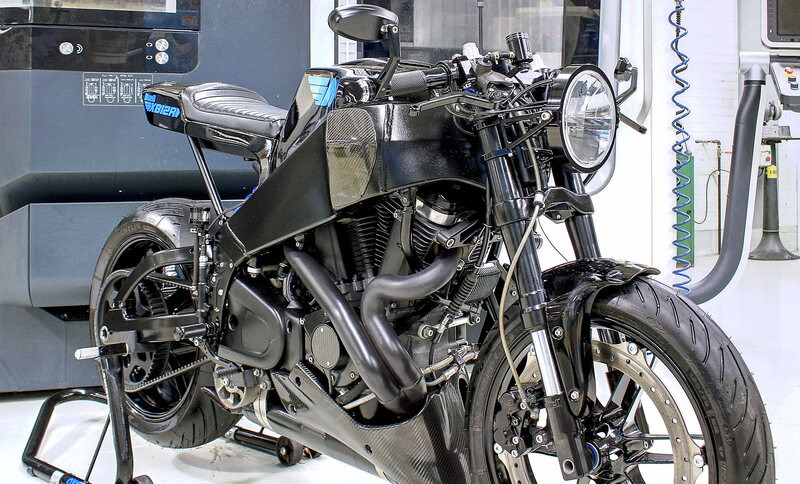 The carbon fibre doesn’t finish there with the chin spoiler and frame protectors also made from the high-tech product and with a cut down front fender the weight savings all start to add up. 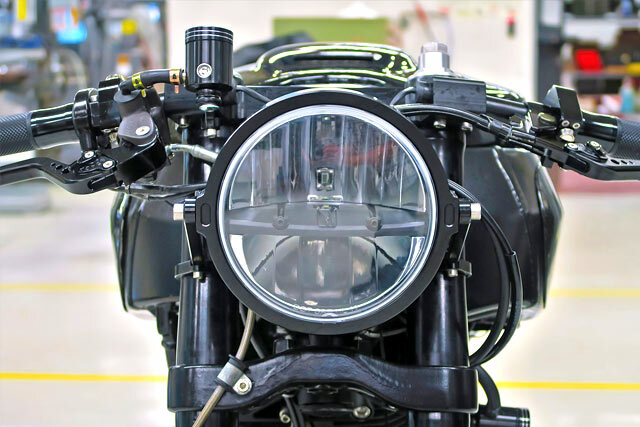 The bodywork re-design has meant that an entirely new wiring loom was required to reposition the bikes many sensors and once again the Professor of electronics has done it to perfection. 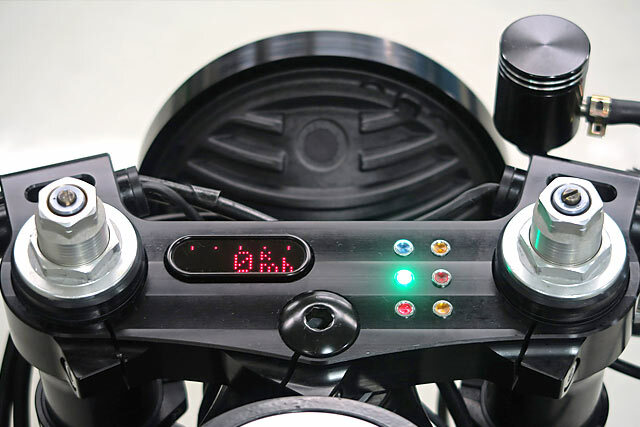 A Motogadget m-Unit is the heart of it all and includes their stunning switchblocks. 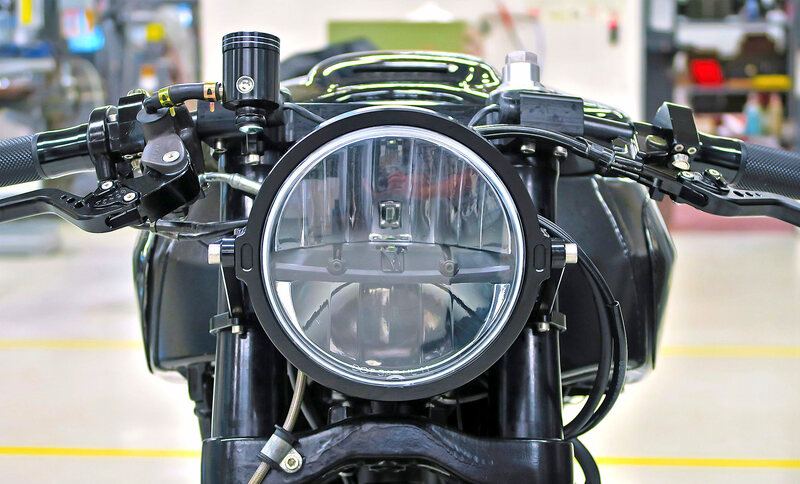 Simplifying the design is a single LED headlight and integrated taillight. 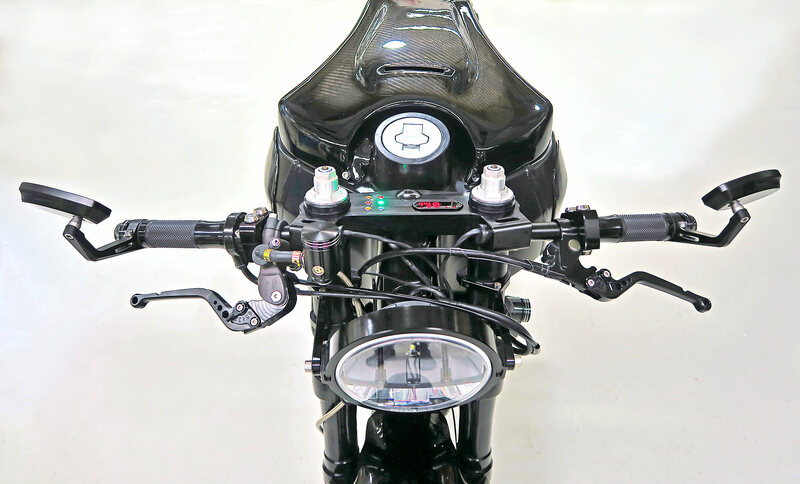 With the bulky gauges also ditched the small Motogadget speedo and idiot lights are all mounted in the sublime top triple clamp that was made in-house on the big dollar 5 axis milling machine. 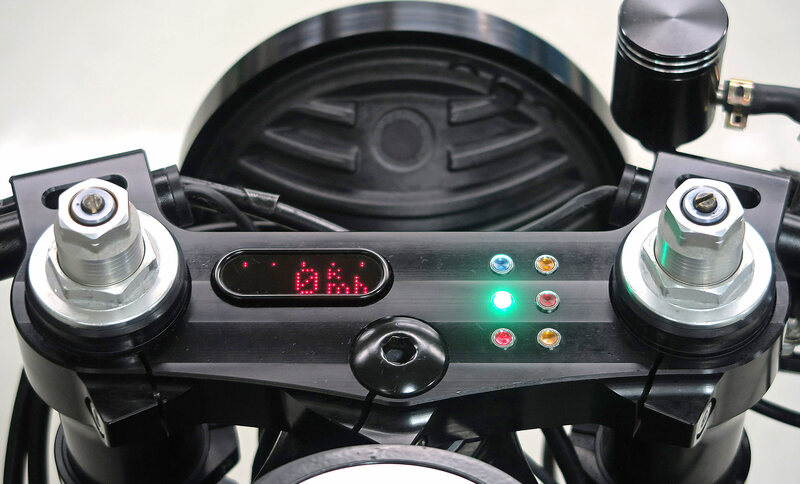 It incorporates the clamps for the clip-ons that feature bar end indicators and mirrors. 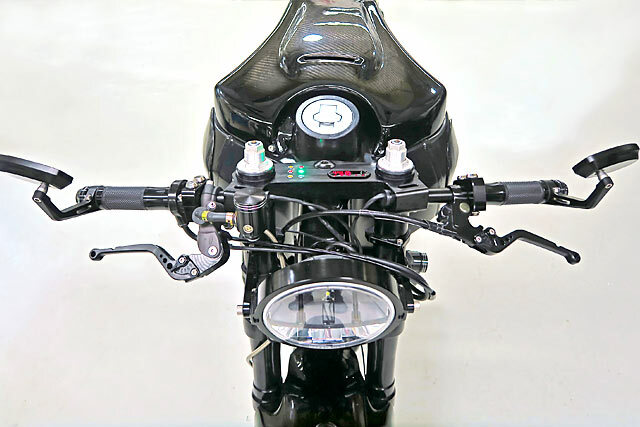 A set of billet rearsets saves even more weight and finally the combined genius of Buell and Carignan comes to life. 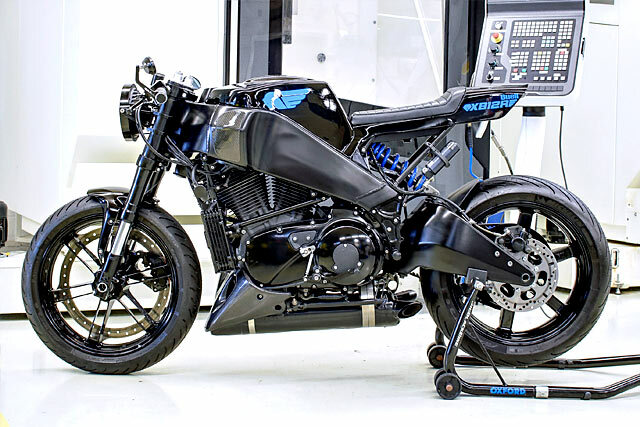 It’s typically American with the thumping twin, maintains the quirky innovations of Buell and brings big dollar boat technology to create the sort of cutting edge, lightweight body that wins races around the world. 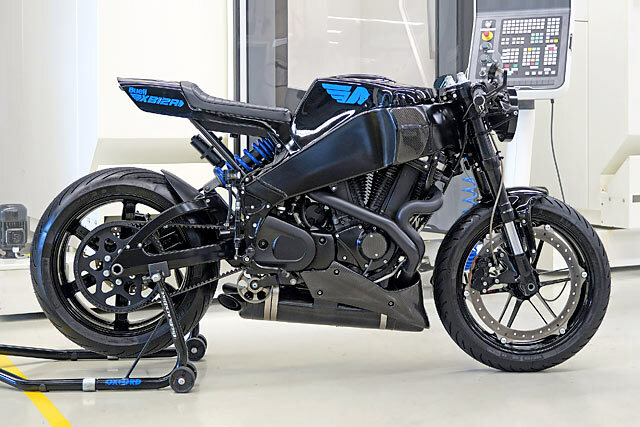 Simone might be one man’s personal project, but it’s also a rolling example of the incredible cafe’d Superbike North America is really capable of when its best and brightest unite!